Killerspin Revolution SVR is beautifully designed to look good at home, or in the office. The deep blue table top and silver base this ping table a sleek, elegant look. 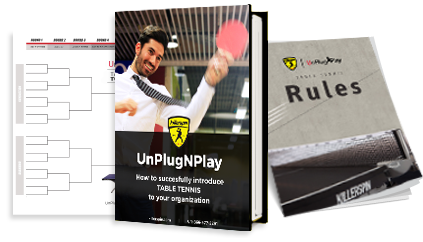 , a composite material made of aluminum and plastic PE (polythene) core, forms a solid base for the 1” MDF table tennis top. Adjustable legs ensure the surface is perfectly level, and a convenient drawer provides space for ping paddles and balls. Our Revolution SVR table tennis table is suitable for friendly competition as well as fierce tournament play. The anti-glare surface finish and lines ensure a world-class ping experience. We love it! It's perfect in the space and the we are really excited about it!